I love technology when it helps. Are you looking to increase your sales, using a great new lead generation tool? Among the others, Leadfeeder is what I recommend if you need to identify and track potential leads easily and quickly. You will have the possibility to monitor who visits your website and where they’re from. Isn’t great? Being aware of who is looking at you, marketing actions can be made with a specific target. This is exactly what we do at DESITA and we usually invite our customers to use this tool to be more active in this competitive market. Leadfeeder. It’s a kind of magic! Tokyo’s Logbar uses iPads to enable its patrons to make their own concoctions and add them to the menu for other guests to buy. During my daily research on the web I usually find great ideas or new trends that help me to enlarge my professional know-how and related vision but today, thanks to my friend Silvia who forwarded me this news, I’m glad to share with you something which sound to me like a new era of social entertainment or social involvement and why not a new way to make profit. Here how it works: “Each customer is handed an iPad Mini upon entering Logbar and is required to create an account and fill out their personal profile before they can use the device. When they do, they can access the bar’s drinks menu, place an order and take advantage of a number of social features, such as liking and sharing their favorite cocktails and chatting with friends and other guests. Each account holder gets a news feed which logs their recent orders, shows them what other people in the bar are drinking and offers recommendations based on their choices. 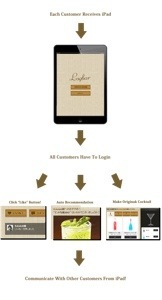 While Logbar stocks many popular cocktails such as Mojitos and Martinis, the platform enables users to make their own cocktails by selecting the glass, alcoholic ingredients, mixers and adornments. They can then order the creation, name it and add it to the menu for anyone else to try. Important: Creators receive JPY 50 whenever someone else orders their creation. Do you think this kind of interactivity could be healthy for the business? Barista, lei è proprio un cafone! Il 29 agosto scorso mi sono recato all’aeroporto di Bologna, per partire alla volta di Catania e quindi raggiungere Messina. Un importante incontro di lavoro mi stava aspettando. Visto che il mio volo era previsto subito dopo l’ora di pranzo, mi sono avvicinato al bar Bollicine, quello situato proprio frontalmente alla salita delle scale mobili, zona partenze ovviamente. Dopo aver aspettato il barista che doveva monitorare il passaggio delle turiste e dopo essere riuscito a fare lo scontrino per: panino, bibita e caffè, mi sono spostato al lato della cassa per poter consumare il mio “pasto” in tranquillità. Ecco l’assurdo manifestarsi improvvisamente: dopo aver provato a masticare il panino, impresa ardua dato la sua consistenza – avete presente il pane scongelato e riproposto probabilmente dopo alcuni giorni? – mi sono rivolto al barista dicendo educatamente: “mi scusi, ma questo pane è immangiabile”. Di tutta risposta il barista mi ha lanciato un sguardo di insufficenza, come se il pane fosse cattivo per colpa mia, e dopo aver allargato le braccia come se fosse passato li per caso, se ne è andato dall’altra parte. Per il nervoso, pur di non aver a che fare con quel cafone, non ho neanche chiesto il caffè. Naturalmente il panino è finito nel bidone. Al mio arrivo a Catania, mi sono piacevolmente trovato la risposta: “@norman_cescut Ci dispiace per l’accaduto, lo segnaliamo subito affinchè non si ripeta più”. Il tutto visibile nella mia Timeline di Twitter. I famosi “complain form” presenti all’estero, non hanno mai funzionato in Italia, ma finalmente adesso c’è la possibilità di comunicare in diretta con chi d’interesse. Ora, non ho la certezza che abbiano preso veri provvedimenti, anzi invito l’aeroporto di Bologna a comunicarmelo, ma certo è che comportamenti del genere non possono e non devono passare inosservati. 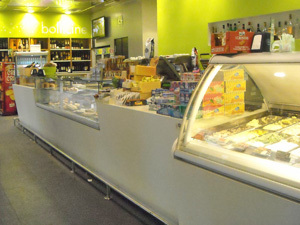 Aggiungo solo una cosa: saper fare un caffè o allungare un panino al di là del bancone, non significa essere baristi, professione nobile e altamente qualificata ma non è solo colpa del barista ma anche del gestore che non fornisce la formazione adatta o se lo fa, non monitora l’operato. Fino a prova contraria, mai più al bar Bollicine! The stats come from Shoppercentric’s ‘Shopping in a Multichannel World’ survey, and the results show that customers are using a wide variety of channels. Mary Portas may have managed to produce a retail review containing just three references to digital, but online and mobile is vital for the future of the high street. 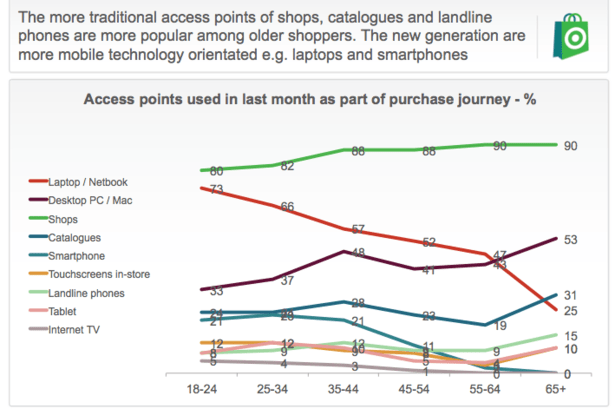 The high street store still remains the most used channel, though for younger age groups, laptops and netbooks come pretty close. In general, younger shoppers are more likely to use smartphones (and, to a lesser extent, tablets) as part of the purchase process. Smartphones have now reached 45% penetration, but for the under 34 age groups, this rises to 62%. As we’ve covered before, iPads can deliver impressive conversion rates and average order values (AOVs) but they are used by just 7% of shoppers. At the moment, since the relatively expensive iPad is the dominant tablet, it may be that the wealth of the average owner means higher spend. 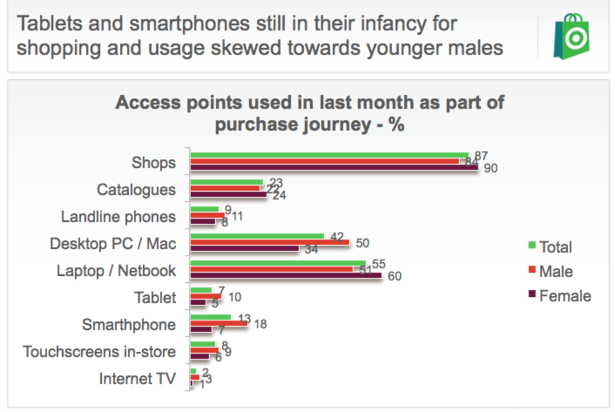 However, tablet use is set to grow, so retailers should look at adapting their websites and marketing for this device. The high street will always have a place. In fact, 45% of shoppers said they will ‘always love going to the shops, no matter what new technologies are available’. These, and other multichannel retail stats, show that customers are rapidly adopting new channels such as mobile, and also that they will choose the one that suits their needs most at the time. Offline retailers that are able to adapt to customers’ use of multiple channels will be best placed to prosper. This means things like launching mobile optimised sites, putting wi-fi in stores (to allow customers to view reviews, compare prices etc), having easy reserve and collect services, and in-store kiosks. Retailers shouldn’t necessarily assign fixed roles for channels. Customers may well research online before heading to a store to make a purchase, but the reverse is equally likely. The trick is to understand that customers will use channels for a variety of purposes, and to deliver a smooth and seamless experience whichever one the customer chooses. via The high street is central to multichannel retail strategy: stats | Econsultancy. 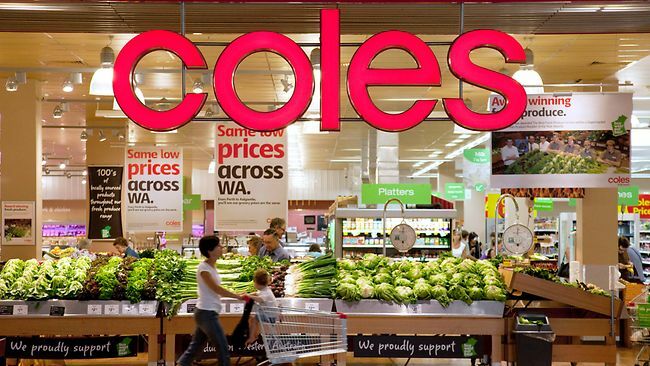 Despite extensive research conducted by the Food Standards Australia proving there are no adverse affects to consuming products with added MSG (monosodium glutamate) and artificial colourings, Coles has removed both ingredients in direct response to consumer concerns. She added that it is possible a few consumers may experience intolerances but that they would not be life threatening like major allergies. The retail giant’s private label range is now entirely free from artificial colours and MSG, following a five-year project to reformulate all of its own food and beverage brands. “Our customers are clearly concerned by food additives and the effect they believe they have on their health. A significant number have indicated that they or their children have experienced reactions to artificial colours and MSG,” Jackie Healing, quality manager for Coles said. This move is simply a reaction to this, Healing added. The supermarket noted that research showed 91% of customers were worried about consuming products with added MSG and artificial colours, with 76% avoiding such products. Vanessa Walles, marketing manager at natural ingredients supplier Chr Hansen Australia, said “Coles are being pro-active by taking this stance, it is not because they have to,” and consumers will appreciate this.“It certainly sends a very positive message that Coles is listening to consumer needs and moving with the market expectation of natural colours,” Walles said. There are no laws against the use of MSG and artificial colourings in food and beverage products in Australia. Food manufacturers are just required to label a food when MSG is added, either by name or by its food additive code number 621. Walles noted however, that consumer pressure fuelled by media focus on artificial colours and MSG has created a market demand for products free from these additives. “Natural is the way the colours market is moving”, Walles said. Add to this, the Southampton Six ruling in the EU where manufacturers using artificial colours have to provide the warning label, ‘may have an adverse effect on activity and attention in children’, and there is a burgeoning pressure towards natural products, she said. Similarly Aldi’s removal of artificial colours may have been an influencing factor, she added. “Many branded products have already made the switch from artificial to natural colours, however there are still many products to follow suit,” Walles said. via Coles ‘goes natural’ for consumers. Nintendo’s Wii platform has already sparked applications well beyond the world of gaming, so it’s not entirely surprising to see Microsoft’s Kinect do much the same thing. Enter Shopperception, a Kinect-based tracking system that gathers data on shoppers’ interactions with the products on retail shelves. One would be hard-pressed to think of a better way to study consumer behavior than by unobtrusively tracking real-world shoppers in a natural retail setting. 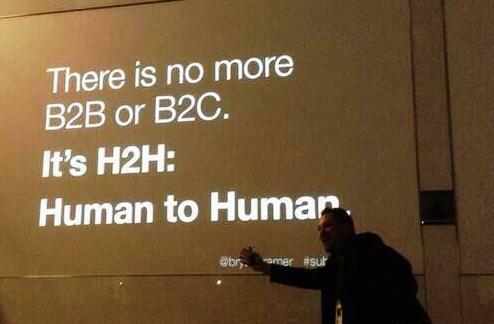 Brands, retailers and researchers: one to get involved in! via In retail stores, research tool uses Kinect to track shoppers’ behavior | Springwise. Will Sustainability be mainstream by 2020? New Report says yes. Household brands and retailers will play a key role in supporting sustainable lifestyles, helping them become mainstream by 2020, according to a new study. Sainsbury’s and Unilever launched the Consumer Futures 2020 research in partnership with Forum for the Future, in order to gain insight into how sustainable products and services will impact on global trends and consumer behaviour over the next decade. As part of the 18-month study, designed as a practical tool to help retailers, brands and manufacturers plan for the future, four fictional scenarios that consider how sustainable consumption could become mainstream were explored, with the aim of ascertaining whether social and environmental pressures drive sustainable goods into the mainstream, or whether consumers actively demand them. It found that global challenges such as climate change, scarcity of key resources, rapid population growth were likely to affect consumer attitudes and the consumer goods industry. As a result, sustainable practices will become more mainstream as key resources become more highly valued, while and recycling and re-use would increase, the study concluded. A weak global economy is unlikely to hamper the progression of sustainability, according to Forum for the Future’s chief executive Dr Sally Uren, who said that “smart brands and businesses will make money today by accelerating the transition to a sustainable future”. However, the study warned that consumer brands will need to innovate to develop sustainable products, services and business models to overcome financial challenges, while also working with consumers to make them a success. Sainsbury’s and Unilever said they plan to use the results as a platform for collaboration and innovation to develop jointly profitable and sustainable initiatives to help meet commitments in Unilever’s Sustainable Living Plan and Sainsbury’s five corporate responsibility values. The Consumer Futures 2020 toolkit and accompanying resources are available to download free here. via Will Sustainability be mainstream by 2020? New Report says yes. | Caelus Green Room.